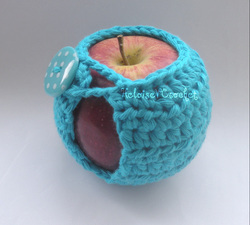 All you need to create your own quirky gifts! Please allow 1 week for posting. Payment is via PayPal.Available to order (UK only at the moment). Please let me know your colour scheme on checkout, otherwise random colours will be chosen for you. 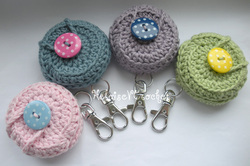 Your kit will include enough cotton yarn, keychains and buttons to make either 4, 8 or 12 keychains in addition to the above. Already got the hook? Select Yarn, Button & Pattern only option. 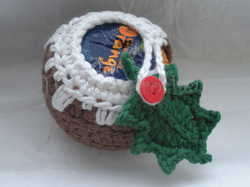 Your kit will include chocolate brown, white and green cotton yarn and red berry buttons in addition to the above. 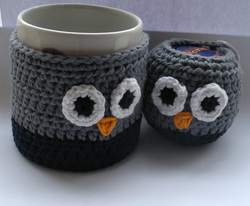 Your kit will include the pattern to make up to 4 owl apple and mug cosies: 2 different colours of cotton yarn plus black, white and orange for the features and 4 buttons in addition to the above. Bigger pack has 4 colours and 8 buttons.